Argan Oil is a rich source of Vitamin E, antioxidants (tocopherols) and essential fatty acids that help to fight the skin ageing process. 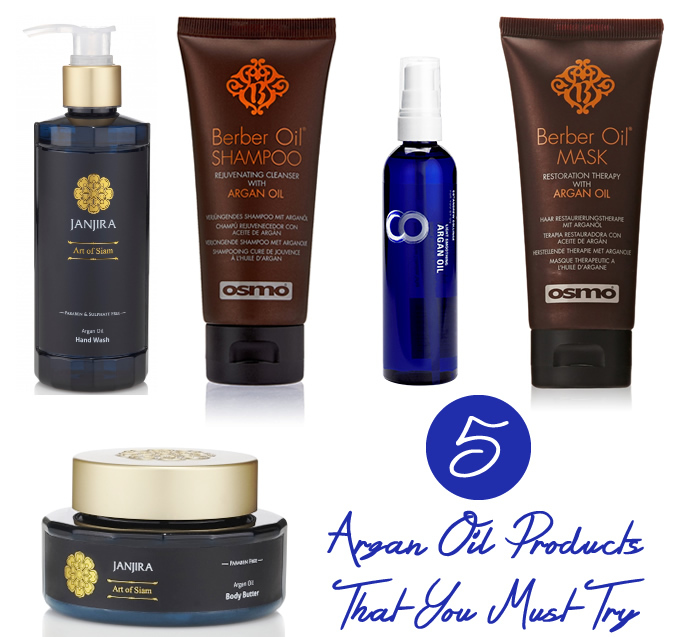 Not just the skin but Argan Oil works wonders for hair and nails too. If your hair and skin are dry or if your nails are brittle then Argan Oil is the oil that you should be reaching out to. In addition to being used in the natural oil format, Argan Oil is now used in a number of skin and hair care products. Here are 5 such products that have become favourites of mine. Beautifully presented this hand wash with Argan Oil cleans hands without over-drying them. It has a wonderful scent of Lavender and Eucalyptus and also contains anti-bacterial and anti-fungal agents offering effective cleansing while also providing hydration to hands. As you can see from the name, this one is described as a rejuvenating cleanser with Argan Oil. The shampoo has a very lovely, sweet fragrance and is said to infuse the hair with essential moisture and hydration while also adding shine and radiance. The shampoo contains an unique blend of oils (Argan Oil included) combined with Panthenol to help strengthen and repair. I liked the fragrance of this shampoo and how it is very gentle on my hair. If used post a hot-oil hair treatment, I need to use it twice to get the hair really clean and soft. But for normal daily use one wash works nicely. I think this shampoo is more suited to fine and dry hair. Follow it up with the Osmo Berber Oil Restoration Mask and hair feels really hydrated and soft. A product that assists with quick and easy blow drying as well as conditioning and adding shine to hair, this is a must-try if you have dry and frizz-prone hair. I use it mainly before blow drying my hair and it helps keep the frizz and stray flyaways under control. You can read more about the product here. Including a combination of oils like Argan, Avocado and Olive, this restoration mask is an intensely nourishing mask that helps to restore hair to its full glory. You can use it as a daily conditioning mask by leaving it in hair for a couple of minutes after shampooing. Alternatively you can use it as a weekly treatment by leaving it on 5 minutes or more. The mask has a lovely fragrance and leaves the hair smooth and silky making it easier to style. While it suitable for all hair types, I think it works very well for dry hair. A luxurious and highly moisturising body butter that is packed with the goodness of Shea Butter, Jojoba Oil, Soybean and Argan Oil, this one has become one of my favourite body butters. It offers excellent nourishment and moisturisation to the skin. The texture is silky and lightweight and it gets absorbed very easily leaving my skin feeling wonderfully soft and supple. The combination of Lavender and Eucalyptus Oils is very pleasing. Try it - your body will love the luxurious pampering. More about Janjira here.